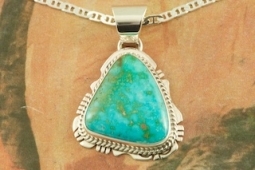 Genuine Royston Turquoise set in Sterling Silver Pendant. Created by Navajo Artist Larson Lee. Signed by the artist. Free 18 inch Sterling Silver Chain with purchase of pendant. Royston Turquoise Mine was originally known as the Royal Blue Mine. It produces Turquoise that has a mixture of blues and greens in the same formation. The Royston Turquoise Mine is located in Nye County, Nevada. Pendant is 1 3/8" L including the bale x 7/8" W.